Files lets me open any non-existent folder in it and view it as if it were empty. On attempting to copy something there it throws an error. It should display a notice that the folder doesn't exist and maybe provide an option to create it too. Targeting to beta2 because it's a more generic solution to bug 1065512 which was targeted to beta2. Oddly enough, the necessary bits to correct this behavior already exist, but they are only triggered when trying to access a nonexistent folder which has the same name as any file under the current directory. And even then, it works only once. See the screen cast attached. 4. Press Enter. The folder will be opened even if it doesn't exist. If you'll try to create a new file or to copy one there, you'll get copying error. Files App must write an error like 'Folder doesn't exist' when trying to reproduce step 4. This is a simple fix that uses the existing "DirectoryNotFound" class when a non-existing location is entered on the command line or the location bar. Your fix is, in principle, the same as one I did earlier this year (https://docs.google.com/document/d/1ExQQkGt2js04lTtvJVDeuV-wPXhZiqYAEs3DdgRuVKI/edit?usp=sharing). I suggest you take a look at what I did. Some of the bugs/quirks I already took care of may be still be present in your patch. look at it and investigate the bugs you mentioned. > took care of may be still be present in your patch. > were empty. On attempting to copy something there it throws an error. > provide an option to create it too. is still alive in the current branch but I have submitted a patch. It's unfortunate that my branch fails to build nowadays. It may be necessary to merge and commit changes from trunk first. If you can't reproduce any of the crashes, then it's excellent! But are you sure that all of the issues I mention in the GDoc are solved with your patch? "4) If there is more than one level of nonexistent folders - e.g. trying to access /home/julian/omg/wth/ but neither “omg” nor “wth” exist - the creation of “wth” fails, because “omg” doesn't exist. Files should create all the necessary folders at this step. 5) Use Granite's Welcome Screen. 6) When this view is active, attempting to reach another non-existent folder below the current non-existent one will leave the location bar in a weird state. When creating this other folder or going back to another one, the location bar goes back to normal." Number 5, while technically not being an issue, it's very easy to implement. For number 5, see http://bazaar.launchpad.net/~junrrein/pantheon-files/fix-1022934/revision/1097 (ignore the changes to src/View/ViewContainer.vala ). For number 4, see http://bazaar.launchpad.net/~junrrein/pantheon-files/fix-1022934/revision/1098. While this works, it never frees the memory allocated in line 6361 in libcore/marlin-file-operations.c . While I didn't try your patch, can you verify that creating a directory using your patch doesn't duplicate that dir's entry in the back button's history? This doesn't matter very much and can be fixed later, but just for the record. Nice work finding and fixing bug 1184104! And finally, thanks for your commitment! I will look at these bugs more closely and get back to you. > necessary to merge and commit changes from trunk first. > If you can't reproduce any of the crashes, then it's excellent! > create all the necessary folders at this step. > 5) Use Granite's Welcome Screen. > one, the location bar goes back to normal." > http://bazaar.launchpad.net/~junrrein/pantheon-files/fix-1022934/revision/1097(ignore the changes to src/View/ViewContainer.vala ). > Nice work finding and fixing bug 1184104! > And finally, thanks for your commitment! I tested your patch, and I found out that items number 1, 2 and 6 lined in my GDoc still happen. I believe it is caused by a change in trunk that changed the settings schema. I will try merging changes from trunk to see if I can make it run. My branch is now updated to match trunk as of today. I tested and it builds and runs fine. Happy hacking! In fact, I notice my branch behaves pretty well, with no crashes. I will go ahead and propose it for merging. You are right my initial patch only addressed the immediate problem - not all the issues you pointed out. I have also produced a new patch (sorry - I didn't realise you had restarted work on yours) which seems to address these issues. Rather than use recursion I changed DirectoryNotFound.vala to use the GLib.File.make_directory_with_parents function, which seems simpler. 3) Browser only records directories that actually exist so you cannot browse back to a non-existing directory. and I have attached a diff. Thank you, and don't apologise. We can work together on this one. I didn't use GLib.File.make_directory_with_parents deliberately, because it isn't asynchronous, meaning that it will lock the UI until the operation is over. This doesn't seem to be a dealbreaker at first, until you account for creating folders over slow network drives, which could cause a period of unresponsiveness. As for the other items, I will look into them and try to incorporate them in my branch - with the due credit, of course! I recommend not to show the full path to folders, because Granite's Welcome Screen doesn't wrap text to new lines. See the attachment. created rather than the full path (prefixed with .../). use the Granite Welcome Screen rather than a custom one). than just the last folder. > Welcome Screen doesn't wrap text to new lines. See the attachment. 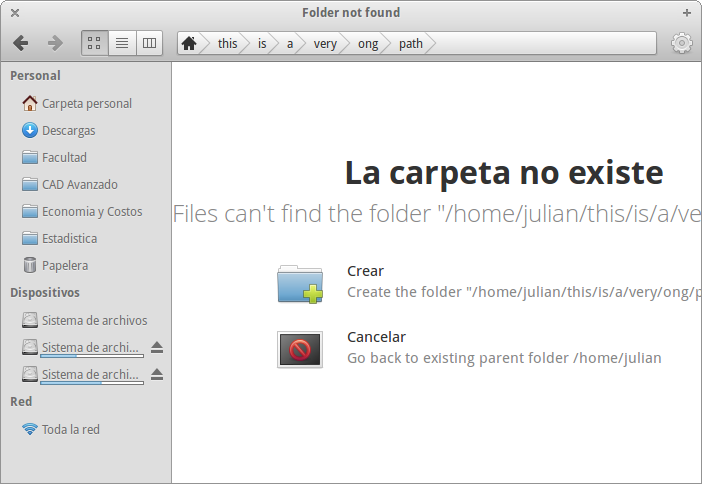 > ** Attachment added: "Captura de pantalla de 2013-06-07 10:54:01.png"
then an asynchronous solution would be better. > Thank you, and don't apologise. We can work together on this one. > cause a period of unresponsiveness. > them in my branch - with the due credit, of course! I will forward this exchange to the reviewers of my branch, so we can have their opinion.